Beautiful detached house situated on a large plot in a stunning omgeving.Je here enjoy all the comfort and convenience of home. From the house you can enjoy the beautiful countryside of Värmland with her beauty to vast forests, winding rivers and deep blue lakes. Near Myra is characterized by rolling hills with rocks, forests and quiet lakes where you can enjoy the peace, quiet and space around you. Beside a beautiful view You can walk around, swimming, mountain biking, canoeing, fishing, golfing, boating and horseback riding. In the fall you can in the woods around the house picking delicious blackberries, blueberries and mushrooms, they grow in abundance. In the winter you can here also ice fishing, skating, skiing and cross country skiing. 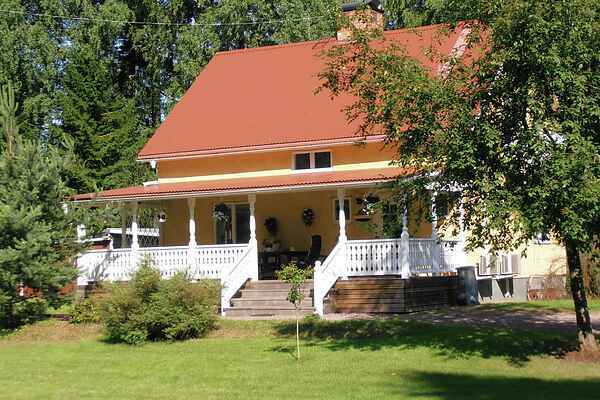 The house is in the middle of Sweden and is therefore a very convenient base for travel in Scandinavia. Pay a visit to cities like Stockholm, Gothenburg and Oslo.